Sir Arthur Henry Rostron, KBE, RD, RNR (14 May 1869 – 4 November 1940) was a seagoing officer for the Cunard Line. He is best remembered as the captain of the ocean liner RMS Carpathia, when it rescued hundreds of survivors from the RMS Titanic when the latter ship sank in 1912, after colliding with an iceberg in the middle of the North Atlantic Ocean. Capt. A.H. Rostron while master of Carpathia in April 1912, at the time of rescuing Titanic survivors. Rostron won wide praise for his energetic efforts to reach the Titanic before she sank, and his efficient preparations for and conduct of the rescue of the survivors. He was awarded a Congressional Gold Medal by the U.S. Congress, and in 1926, he was appointed Knight Commander of the Order of the British Empire. He rose to become the Commodore of the Cunard fleet, and retired in 1931. Arthur Rostron was born at Bank Cottage, Sharples, a suburb of Bolton, Lancashire, England to James and Nancy Rostron in 1869. Educated at Bolton Grammar School from 1882 to 1883 and Bolton Church Institute in 1884, Rostron then joined the Merchant Navy Cadet School Ship HMS Conway as a cadet. After two years of training on the Conway, he was apprenticed to the Waverley Line of Messrs Williamson, Milligan and Co in Liverpool on the iron clipper ship, Cedric the Saxon. In 1887 Rostron joined the barque Red Gauntlet as a second mate. Soon after, he left the Waverley Line and joined the barque Camphill. He was commissioned a sub-lieutenant in the Royal Naval Reserve on 28 April 1893. In December 1894 Rostron served on board the steamship Concord after which he passed the examinations for his extra master's certificate. He joined the Cunard Line in January 1895 and earned a position as fourth officer on the ocean liner RMS Umbria. On Sep 14,1899, Arthur Rostron married Ethel Minnie Stothert, daughter of Richard Stothert in St John the Baptist church Atherton. In the years afterward he would serve on other Cunard ships including the Aurania, Etruria, Servia, Cherbourg, Ultonia and Saxonia. As a member of the Royal Naval Reserve, Rostron regularly attended training at HMS Excellent (including in September 1902). He temporarily left the Cunard Line to serve with the Royal Navy during a period of international tension occasioned by the Russo-Japanese War of 1904–1905. Rostron subsequently returned to the Cunard Line. He was made first officer of the RMS Lusitania in 1907, but was transferred to the Bresica and promoted to ship's Captain the day before the Lusitania's maiden voyage. The Bresica and his next several ships served the Mediterranean region, including his first passenger ship, the Pannonia, whose New York City – Mediterranean route he commanded from 1 January 1911. He became captain of the passenger liner RMS Carpathia on 18 January 1912. By this time a lieutenant in the RNR, Rostron was decorated with the RNR Officer's Reserve Decoration (RD) on 9 November 1909. He was promoted to commander in the RNR on 18 January 1912. Carpathia was on its regular route between New York City and Fiume, Croatia when, early on 15 April 1912, she received a distress signal from the White Star Line ocean liner RMS Titanic, which had struck an iceberg. Rostron was asleep when Carpathia's wireless operator, Harold Cottam, contacted Titanic at 12:15 am to relay regular private party wireless traffic from Cape Cod. The sinking Titanic, which had struck an iceberg about 11:41 p.m., replied with a distress message and call for help. Cottam ran to Rostron's cabin to alert him. Rostron immediately ordered the ship to race towards Titanic's reported position, posting extra lookouts to help spot and manoeuvre around the ice he knew to be in the area. Only after ordering Carpathia 'turned to', towards the disaster scene, did Rostron confirm with Cottam that the latter was sure about Titanic's distress call. About 58 nautical miles (107 km) separated Carpathia from Titanic's position. Rostron and his engineering crew, led by Chief Engineer A.B. Jones, skilfully obtained the maximum speed possible from the engines of Carpathia, coaxing her up to 17.5 knots — three and a half faster than her rated speed. Even so, Carpathia, travelling through dangerous ice floes, took about 3½ hours to reach Titanic's radioed position. During this time, Rostron turned off heating to ensure maximum steam for the engines of the Carpathia and had the ship prepared for survivors, including getting blankets, food, and drinks ready, and ordering his medical crew to stand by to receive the possibly injured. Crewmen were placed in the corridors to reassure passengers alarmed by the increased speed and changed direction of the ship. Altogether, 23 orders from Rostron to his crew were successfully implemented before Carpathia had even arrived at the scene of the disaster. Rostron highly praised his crew for their efficiency in his report to line management. Rostron was a pious man: issuing orders, he often raised a hand to his cap and closed his eyes in prayer. Speaking of the risk taken by running through dense ice at speed at night, he is reported to have said "I can only conclude another hand than mine was on the helm." When Rostron believed he was nearing Titanic he ordered green starburst rockets launched to alert the sinking ship if she was still afloat, or her survivors if she was not. Carpathia began picking up survivors about an hour after the first starburst was seen by those in the lifeboats. Carpathia would end up rescuing 705 survivors out of the 2,228 passengers and crew on board Titanic; at least one survivor is said to have died after reaching the ship. After consulting with White Star Line managing director and Titanic survivor J. Bruce Ismay, Rostron decided to turn the ship around and return to New York City to disembark the survivors. Later, Rostron testified at both the US Senate inquiry and the British Wreck Commissioner's inquiry into the sinking of the RMS Titanic. 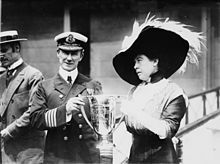 Titanic survivors, including Margaret Brown, presented Rostron with a silver cup and gold medal for his efforts the night Titanic sank. The cup was sold at $200,000 USD at an auction by Henry Aldridge & Son in Devizes, Wiltshire in October 2015. He was also awarded the Congressional Gold Medal, the Thanks of Congress, the American Cross of Honor, a medal from the Liverpool Shipwreck and Humane Society, and a gold medal from the Shipwreck Society of New York. Captain Rostron was highly praised for his efforts in both the American and the British inquiries into the disaster. Rostron continued in command of the Carpathia for a year before transferring to the Caronia. Afterwards, from 1913 to 1914 he took command of the Carmania, Campania, and Lusitania. Rostron was Captain of the Aulania when World War I began and the ship was turned into a troopship which Rostron continued to command. In 1915, Rostron and the Aulania were involved in the Battle of Gallipoli in Turkey, for which he was mentioned for his services. In September 1915, Rostron joined the RMS Mauretania and in April 1916 he joined the Ivernia in the Mediterranean Sea. He returned to the Mauretania in 1917 before taking command of the Andania, Saxonia, Carmania and the Mauretania again. 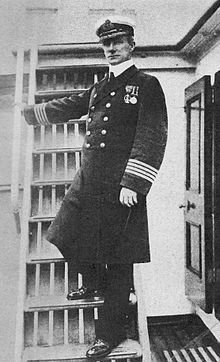 An acting captain in the RNR at war's end, he was promoted to captain in the RNR on 31 December 1918. and made a Commander of the Order of the British Empire in the 1919 New Year Honours list. Rostron continued to command the Mauretania after it returned to normal passenger service in June 1919. From February to May 1924, he served as Royal Naval Reserve Aide-de-Camp to King George V. Rostron retired from the Royal Naval Reserve in May 1924, and in July 1926 he was knighted as a Knight Commander of the Order of the British Empire (KBE). In July 1926 Rostron took command of the RMS Berengaria and became the Commodore of the Cunard fleet shortly after. Rostron lived at Holmecroft, West End, Southampton. After his retirement in May 1931, he became a member, and later, Captain, of the Southampton Master Mariner's Club, and wrote his autobiography, Home from the Sea. When his former ship, the much-beloved Mauretania, sailed for Scotland to the shipbreakers in 1935, Rostron was supposed to have been on board; however, overcome with emotion, he refused to board her and instead waved farewell from pierside, preferring to remember the ship as she was when he commanded her. Rostron and his wife had been visiting their daughter Margaret in Calne when he was taken ill. He developed pneumonia and died at the Cottage Hospital, Chippenham, on 4 November 1940. His funeral service took place at West End Parish Church on Thursday 7 November 1940. He was survived by his wife, Ethel Minnie, and their four children. Ethel died on 7 July 1943 at the age of 69 and is buried beside him in the graveyard of West End Church. He has been portrayed in various Titanic films by several actors. In the 1958 A Night to Remember he is played by Anthony Bushell. In 1979's SOS Titanic he is portrayed by Philip Stone. In the 1996 TV drama Titanic he is portrayed by Terence Kelly. ^ "No. 26720". The London Gazette. 10 March 1896. p. 1612. ^ "Naval & Military intelligence". The Times (36871). London. 12 September 1902. p. 4. ^ "No. 28305". The London Gazette (Supplement). 5 November 1909. p. 8241. ^ "No. 28574". The London Gazette. 23 January 1912. p. 549. ^ "Carpathia History". Archived from the original on 7 June 2010. Retrieved 15 July 2010. ^ "Day 15, Testimony of Harold T. Cottam". British Wreck Commissioner's Inquiry. Titanic Inquiry Project. 24 May 1912. Retrieved 27 April 2011. ^ "Molly Brown's Titanic cup sold at auction for $200,000". Retrieved 27 September 2017. ^ "No. 29603". The London Gazette (Supplement). 30 May 1916. p. 5417. ^ "No. 31099". The London Gazette (Supplement). 31 December 1918. p. 116. ^ "No. 32909". The London Gazette. 19 February 1924. p. 1456. ^ "No. 32939". The London Gazette. 27 May 1924. p. 4200. ^ "No. 32949". The London Gazette. 24 June 1924. p. 4888. ^ Rostron, Arthur (1912). Titanic Hero. Amberley Publishing. p. 107. Cimino, Eric (Fall 2017). "Carpathia's Care for Titanic's Survivors". Voyage: Journal of the Titanic International Society. 101: 23–31. Gowan, Phillip and Brian Ticehurst. "Captain Arthur Henry Rostron". Encyclopedia Titanica. Retrieved 8 October 2005. Wikimedia Commons has media related to Arthur Rostron.